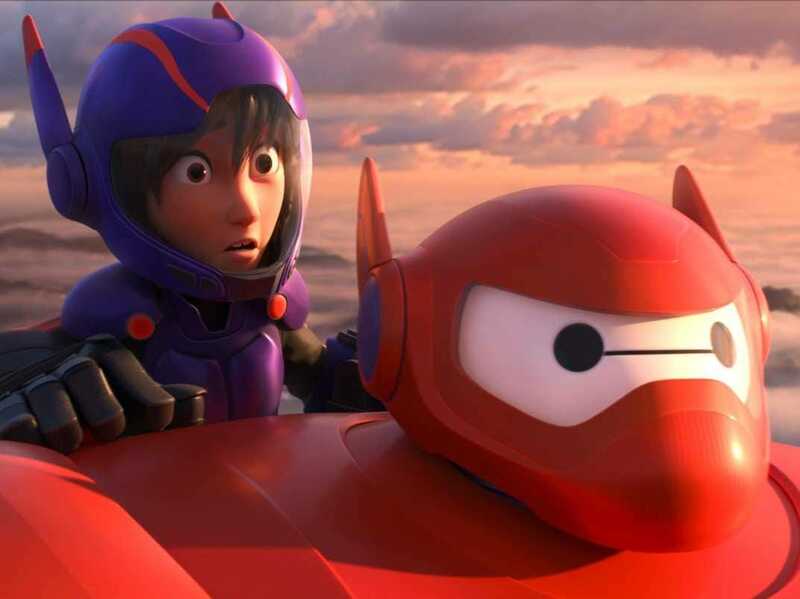 Disney’s newest film, “Big Hero 6,” opens this week. And some eagle-eyed viewers have already spotted some Easter eggs in the trailer that was released over the summer. An Easter egg, as it relates to movies, is when the movie’s creators hide something in the film that’s an intentional inside joke. John Lasseter, cofounder of Pixar and now overseer of all animation projects at Disney, is no stranger to the Easter egg world. 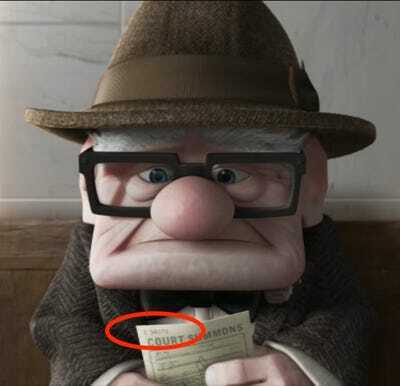 Both of the companies he’s led, particularly Pixar, have included dozens of Easter eggs in their movies. There’s even something called the Pixar Theory, where all the Pixar characters live in the same universe. Some Easter eggs are based on real-world locations. 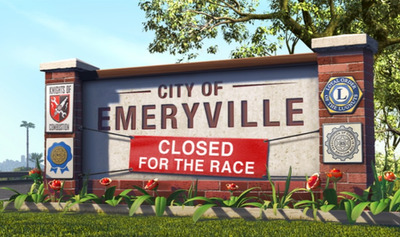 There are obvious ones — in the beginning of the 2006 movie “Cars,” the announcer says the entire town of Emeryville will be closed for the race; Pixar Studios is in Emeryville, California — but some Easter eggs aren’t so obvious. Pixar just announced another sequel to “Toy Story” during Disney’s Q4 conference call. It will come out in June 2017, so it’s a sure bet that even more Easter eggs are on their way. 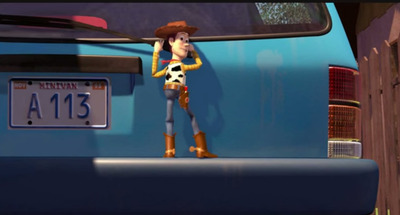 Perhaps the most famous of all the Pixar Easter eggs are references to A113. 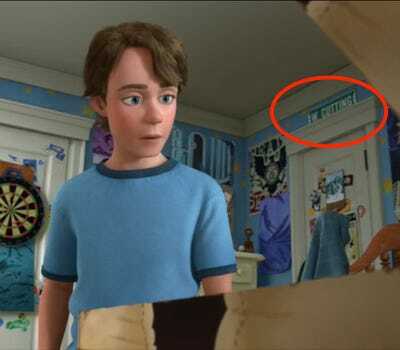 References to A113 can be found in all Pixar movies, some Disney movies, and even in 'The Simpsons' and other animated shows and films. References to A113 can also be found in video games. 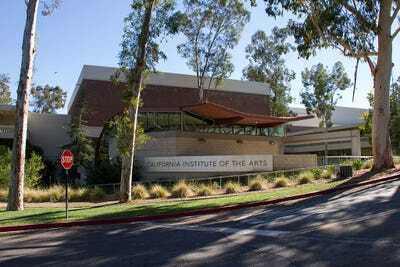 Chances are, if an alum from the California Institute of the Arts is somehow involved, A113 will be included in the animation. That's because A113 is the classrooms used by the graphic design and animation students at the school, including John Lasseter. The real CalArts is located in Southern California. 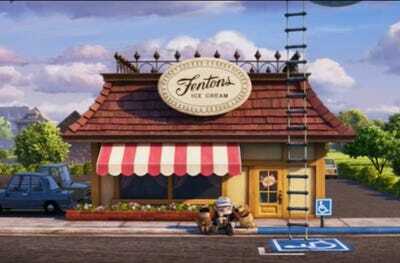 Fenton's Creamery in Disney-Pixar's 'Up' is located in Oakland, California. At the end of the movie, Russell and Carl can be seen eating an ice cream cone on the sidewalk in front of Fenton's Creamery. 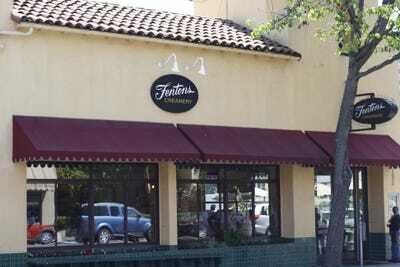 The real Fenton's is a local favourite, located on Piedmont Avenue in Oakland. The ice cream shop opened in 1894, and moved to its current location in the 1960s. It also claims to be where Rocky Road ice cream was born. The Grand Lake Theatre in 'Up' can be found in Oakland, California. This Easter egg is two-fold: many speculate that this was foreshadowing a new 'Star Wars' film. 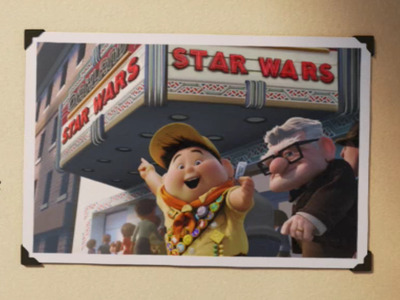 In 2012 -- three years after 'Up' came out -- Disney announced it would release a new 'Star Wars' movie in 2015. 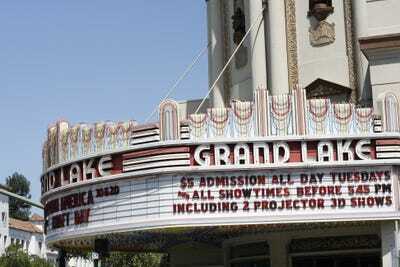 The movie theatre marquee at the end of 'Up' is actually the Grand Lake Theatre in Oakland. It opened in 1926, and in 1981 the theatre and its gigantic rooftop sign were designated historical landmarks. From this angle, you can't see the enormous rooftop sign. 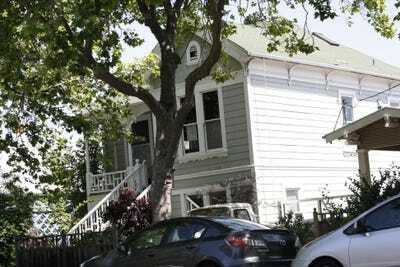 The famous 'Up' house is thought to be on Sixth Street in Berkeley, California. The director of the movie found inspiration for the famous house in a home he drove by on his way to work every day. The Victorian-style house is well-known in the Bay Area. SF Gate's Peter Hartlaub asked the filmmakers at the time about which house in particular inspired the 'Up' house, but neither of them would give him an exact address. He did some sleuthing and determined that the house was probably somewhere on Sixth Street in Berkeley. I drove up and down Sixth Street and saw several Victorian-style houses. 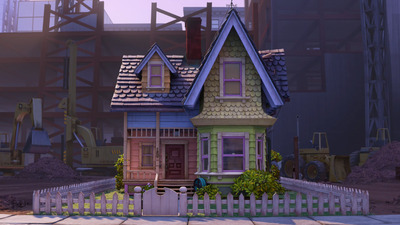 Here's my best guess about the inspiration for the house in 'Up.' It was probably a compilation of several houses in the neighbourhood. Carl is forced by the court to move out of his house and into a retirement home. When he goes to court, he's holding a court summons. The number on the summons -- 94070 -- is the ZIP code for San Carlos, a town about 45 minutes away from Pixar Studios. 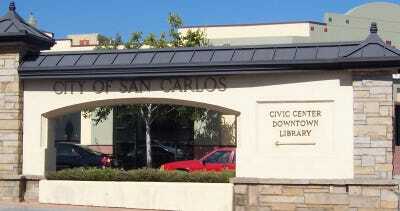 Brad Lewis, who produced Pixar's 'Ratatouille' and directed 'Cars 2,' was the mayor of San Carlos in 2007. 'Up' pays homage to Merritt Restaurant and Bakery. 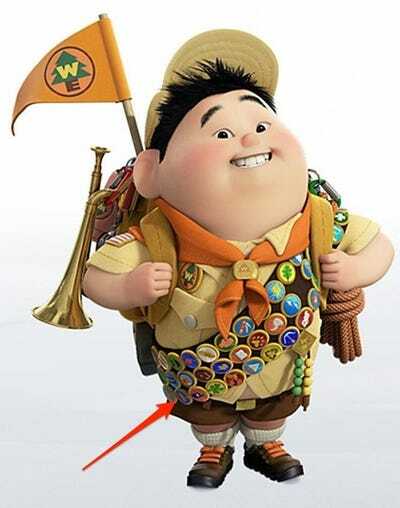 There's a blink-if-you-miss-it moment in 'Up' that also has an interesting background: one of the buttons on Russell's sash is of a hamburger cake. It has a candle in it. Pete (Docter, the film's director) and I, when we work on a film, we go almost every week at night (to Merritt Bakery) to sit at the counter and eat cake and talk about the movie. 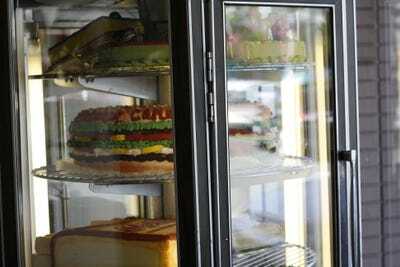 One of the things we saw over there was the burger cake -- it's shaped like a hamburger. We thought 'That is so ridiculous,' so we made it a trend to buy that for our crew meetings. And one of Russell's badges is a burger cake. There's some Oakland love in the movie. The Hidden City Cafe in Point Richmond, California, is where the ideas for several Pixar movies were born. 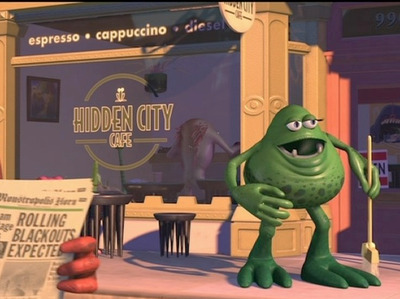 The name of the cafe can be seen on a licence plate in 'Monsters, Inc.,' and the cafe itself also appears in the movie. Pixar University is a development program for people who work at Pixar. It's not a real university, but tributes to it can be found in a few films. 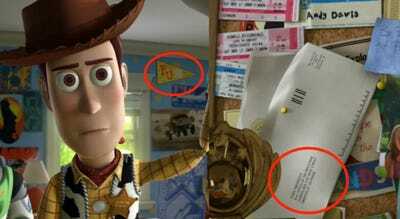 In 'Toy Story 3,' one of Andy's pennants says 'P.U.,' and an envelope on his bulletin board has the address for a college in Emeryville. And in the movie 'Finding Nemo' (not pictured), one of the dentist's certificates was issued by the Pixar University School of Dentistry. 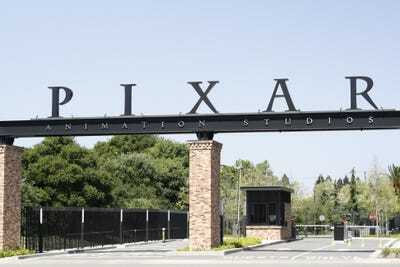 Pixar Studios moved to Emeryville from Richmond in 2000. 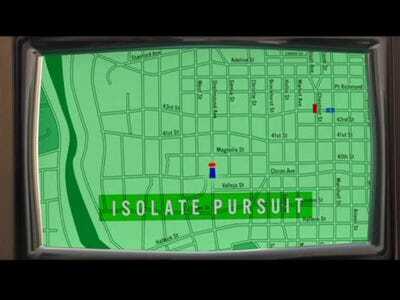 A map in 'The Incredibles' looks very similar to a map of Emeryville. In the beginning of the film, a crook fires a gun at a police car. Mr. Incredible points out the exact street the crooks are on, and his GPS locks onto a location. The location it ends up locking onto is -- you guessed it -- the city of Emeryville, and the crooks just happen to be at Pixar Studios. A lot of the streets on Mr. 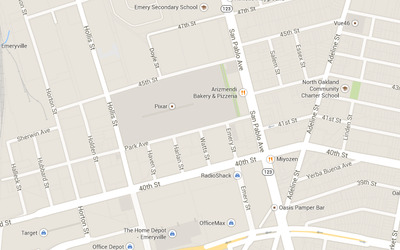 Incredible's map line up with actual streets in Emeryville. 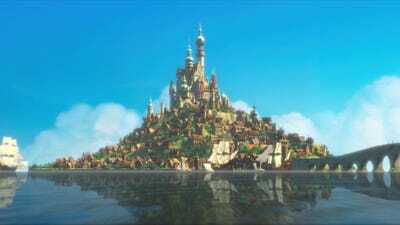 The castle in the film 'Tangled' is based on Mont Saint-Michel in France. The castle in the film 'Tangled' is based on various castle styles. It's not really a secret, but the thing that stands out is that it's on an island. That's because it's based on Mont Saint-Michel, which is also on an island, according to the film's supervising animator, Glen Keane. 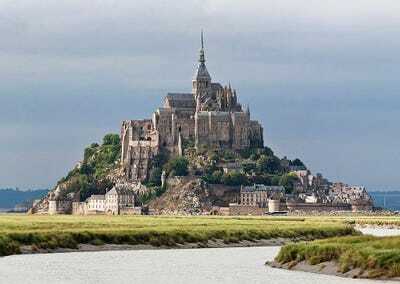 And here's the real Mont Saint-Michel. But that's not the only real-life palace based on the real thing. 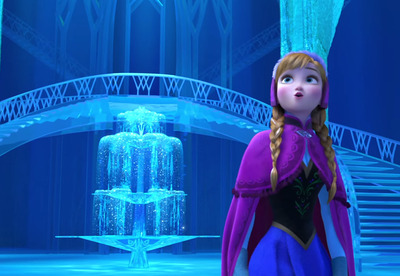 In the movie 'Frozen,' Elsa's palace was inspired by a real-life frozen palace, the Hotel de Glace, in Quebec City. 'Ratatouille' references a hidden 'speakeasy'-like lounge on Pixar's campus. Rumour has it that in the film, one of the storefronts says Bar Des 7 Chanceux. 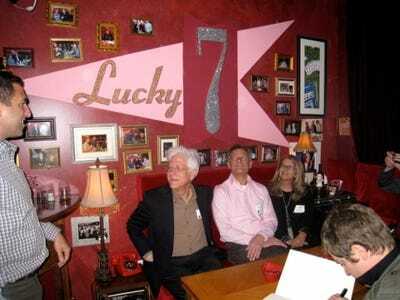 It's named after a secret lounge on Pixar's campus, called Lucky 7 Lounge. According to ABC News, a bookcase in animator Andrew Gordon's office is the hidden entrance to the Lucky 7 Lounge. Steve Jobs even hung out there. I watched the movie a couple times and couldn't actually find 'Bar Des 7 Chanceux,' so perhaps this Easter egg is more of an urban myth than an egg. In 'Toy Story 2,' there's a commercial for Al's Toy Barn, on 1001 W. Cutting Blvd., in Richmond, which is where Pixar was headquartered before it moved to Emeryville. Now 1001 W. Cutting Blvd. 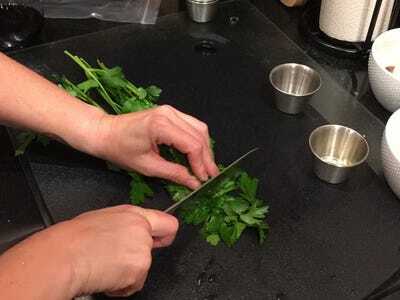 is the home of offices and laboratories. 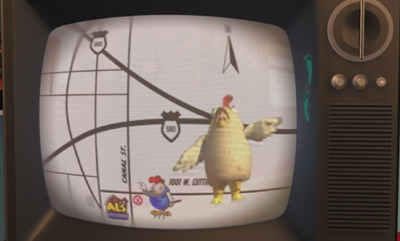 Here's the map to Al's Toy Barn in 'Toy Story 2.' You can see 1001 W. Cutting Boulevard, as well as the 880 and 580 freeways, which are both in the East Bay. 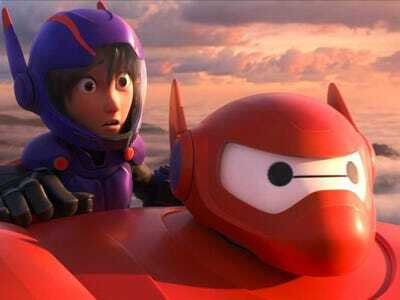 'Big Hero 6' is set in a mashup of San Francisco and Tokyo, called San Fransokyo. But that's not all. Still, that hasn't stopped people from finding some pretty specific references, especially in the trailer for the film that was released this summer. 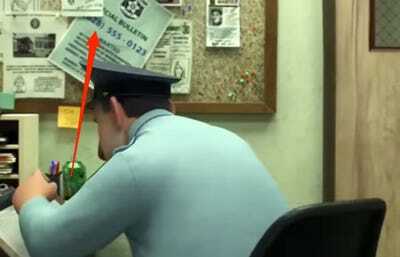 Over the shoulder of the officer, there's a piece of paper on the bulletin board that uses 628 as the area code. New phone numbers issued in San Francisco and Marin will use this area code starting in 2015. The cable car in the beginning of the trailer refers to Powell and Hamakiri Street.